Standing during prayer is an obligatory pillar which cannot be omitted. It is not permissible for anyone to pray sitting unless he is unable to stand, or standing is very difficult for him, or he is sick and there is the fear that his sickness may become worse if he prays standing up. That also includes a paralyzed person who is unable to stand at all, and an elderly person for whom it is difficult to stand, and a sick person who will be harmed by standing because it will either make his sickness worse or delay his recovery. Anas (may Allaah be pleased with him) said: The Messenger of Allaah (S) fell from a horse and was injured on his right side. We entered upon him to visit him and the time for prayer came. He prayed sitting and we prayed sitting behind him. Agreed upon. If he is able to stand but he fears that his sickness will be made worse, or that his recovery may be delayed, or it is too hard for him to stand, then he may pray sitting down. Something similar was said by Maalik and Ishaaq. Maymoon ibn Mahraan said: If he is unable to stand for any worldly purpose, then let him pray sitting. Something similar was narrated from Ahmad. i.e., if he is able to stand for some worldly purpose then he must also pray standing and it is not permissible for him to pray sitting. Then Ibn Qudaamah (may Allaah have mercy on him) said: But Allaah says (interpretation of the meaning): “[He] has not laid upon you in religion any hardship” [al-Hajj 22:78]. Al-Nawawi (may Allaah have mercy on him) said: The ummah is unanimously agreed that whoever is unable to stand in an obligatory prayer may pray sitting, and he does not have to repeat it. Our companions said: That does not detract from the reward that he would earn if he prayed standing, because he is excused. It is proven in Saheeh al-Bukhaari that the Messenger of Allaah (peace and blessings of Allaah be upon him) said: “If a person is sick or is travelling, there is written for him (the reward) for the deeds he used to do when he was healthy or not travelling.” Our companions said: For a person to be allowed to pray sitting down, it is not a condition that he should be completely unable to stand, and it is not enough if he finds it a little difficult; rather what counts is evident hardship. If he fears that it will be extremely difficult or it will make his sickness worse, etc, or a person who is travelling by boat fears that he may drown or become dizzy, then he may pray sitting, and he does not have to repeat it. End quote from al-Majmoo’, 4/201. Shaykh Ibn ‘Uthaymeen (may Allaah have mercy on him) explained the definition of the hardship which makes it permissible for a person not to stand in an obligatory prayer, and how to sit. He said: The definition of difficulty is that which takes away khushoo’ (proper focus and humility). Khushoo’ means that the heart is focused and at peace. If it is the case that standing will make a person severely anxious and have no peace of mind, and he is longing to get to the end of al-Faatihah so that he can bow because he is finding it too hard to stand, then it is too difficult for him to pray standing, so he should pray sitting. The same applies to one who is afraid and cannot pray standing, such as if he is praying behind a wall, and there are enemies around watching out for him, and if he stands they will be able to see him from behind the wall, but if he sits he will be hidden from his enemies. In this case we say to him: Pray sitting. Allaah has exempted the one who is afraid from bowing, prostrating and sitting, and the same applies to standing if he is afraid. But how should he sit? He should sit mutarabbi’an on his buttocks, with each calf tucked up to the thigh. This is called tarabbu’, and in this posture the calf and thigh on the right and the left are all visible, whereas in the case of iftiraash the calf disappears beneath the thigh, but in tarabbu’ all four parts (thigh and calf on both sides) are visible. Is it obligatory to sit like this? No, it is Sunnah. 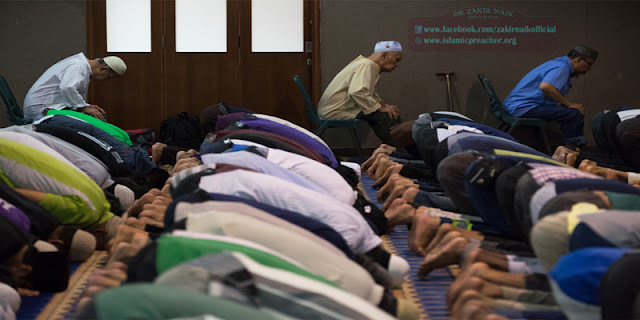 If a person prays muftarishan (in the posture called iftiraash) there is nothing wrong with it, and if he prays muhtabiyan (sitting with one’s legs drawn up and wrapped in one's garment) there is nothing wrong with it, because of the general meaning of the words of the Prophet (peace and blessings of Allaah be upon him), “If he cannot, then sitting.” He did not explain how he is to sit. If a person says, Is there any evidence to suggest that he should pray mutarabbi’an? The answer is yes. ‘Aa’ishah said: I saw the Prophet (peace and blessings of Allaah be upon him) praying mutarabbi’an. And because that is usually more comfortable than al-iftiraash. It is well known that standing needs a longer recitation than saying, “Rabb ighfir li warhamni (Lord forgive me and have mercy on me).” Hence it is better to sit mutarabbi’an. And there is another benefit, which is differentiating between sitting instead of standing, and sitting when one is supposed to sit; if we say that a person should sit muftarishan during the time of standing, there would be no difference between the way of sitting when one is supposed to and the way of sitting when it is done instead of standing. If that is at the time of bowing, some of them say that it should be muftarishan but the correct view is that it should be mutarabbi’an, because when bowing a person’s leg and thigh are upright, and he only bends his back. So we say that if a person is mutarabbi’an he should remain like that and bow in that posture. This is the correct view concerning this matter. End quote from al-Sharh al-Mumti’, 4/461. Al-Nawawi (may Allaah have mercy on him) said in Sharh Muslim: What this means is that the prayer of one who sits brings half the reward of the prayer of one who stands, which means that it is valid but brings a lesser reward. This hadeeth is to be understood as referring to a naafil prayer offered sitting when one is able to stand. This brings half the reward of a prayer offered standing. But if a person offers a naafil prayer sitting down because he is unable to stand, then the reward is not reduced, rather it will be the same as one who stands. With regard to obligatory prayers, if a person prays sitting down when he is able to stand, his prayer is not valid and he will not be rewarded, rather he is sinning. Our companions (the Shaafa’is) said: If he believes that to be permissible, he is a kaafir and is subject to the rulings on apostates, just like one who regards zina (adultery), riba and other haraam things to be permissible. If a person offers an obligatory prayer sitting down because he is unable to stand, or lying down because he is unable to stand or sit, then his reward will be like that of one who stands, and it will not be reduced, according to the consensus of our companions. The hadeeth about the reduction in reward is to be understood as applying to one who offers a naafil prayer sitting when he is able to stand. This differentiation is our view and is the view of the majority concerning the meaning of this hadeeth.